There are all sorts of different mushrooms in the world. From common edible mushrooms to exotic varieties from the far-east, the earth offers thousands of them. Although they are technically a type of fungus, mushrooms are commonly recognized as a vegetable. No matter what dietary system you prefer, whether it’s a keto diet or vegan, mushrooms can play a significant role in health. This article presents a list of edible mushrooms with pictures, nutritional values, recipes, and their health benefits. So, here are nine of the most delicious types of mushrooms you can eat. Cremini mushrooms are a variety of fungus that belongs to the white button mushroom family. The species name is Agaricus Bisporus, and this family of mushroom also includes portobello. These three mushrooms—cremini, portobello and white button—are the three most commonly consumed in the world (1). That being said, these three mushrooms are actually the same mushroom. Although they look different, the varying appearance just depends on age. White button mushrooms are the freshest and youngest, then cremini, and portobellos have been left to mature for a long time. Compared to white buttons, cremini mushrooms have a browner color, a meatier texture, and a deeper flavor. Key Point: Cremini mushrooms are fairly nutritious and very tasty. They belong to the Agaricus Biporus family, and they are slightly further in maturation than white button mushrooms. These are certainly one of the most unusual types of edible mushrooms. Morel mushrooms (Morchella esculenta) look like honeycomb on a stick, and they have a strange, mysterious appearance which suggests we probably shouldn’t eat them. However, eat them we can, and they taste as unique as they look. If you have tried shiitake mushrooms before, then you’ll understand the “meaty” taste they have. These are like that, only much more intense and they have a kind of nutty flavor too. In short, if you like shiitake you’ll probably love Morels. I do. It’s hard to cultivate morel mushrooms on a large scale, so it’s rare to find them in a store. However, we can pick our own, or we can grow them ourselves. Growing kits to make your own are available too, and they can safely grow in the garden. 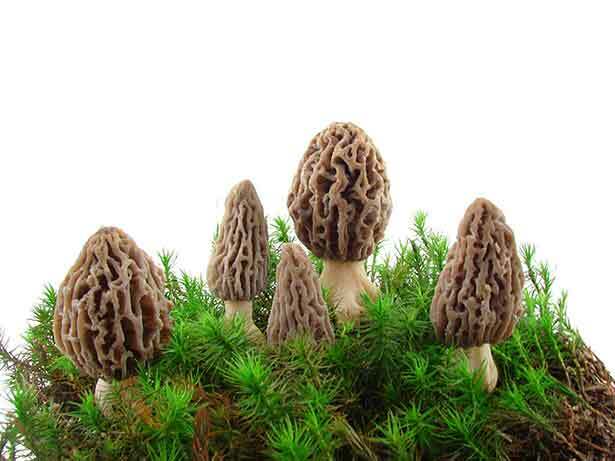 Key Point: Morel mushrooms are unique in both taste and appearance. Unfortunately, they are almost impossible to buy, but we can easily pick or grow them ourselves. Shiitake (Lentinula edodes) is one of the most infamous types of mushroom and for a good reason; they taste delicious. With a meaty, chewy taste, they go well with almost everything. Enjoying the most popularity in Japan—their homeland—they are famous for having a variety of health benefits. For instance, they are particularly renowned for their anticarcinogenic and antimicrobial properties (4). In a randomized dietary study of 52 healthy men and women, those given dried shiitake mushrooms showed improved immunity and lower levels of CRP (a marker of inflammation). On the positive side, the dosage was at realistic consumption levels in everyday life (4). Inflammation is a leading cause of most chronic disease, and immunity helps our body fight illness, so these are excellent benefits (5, 6). 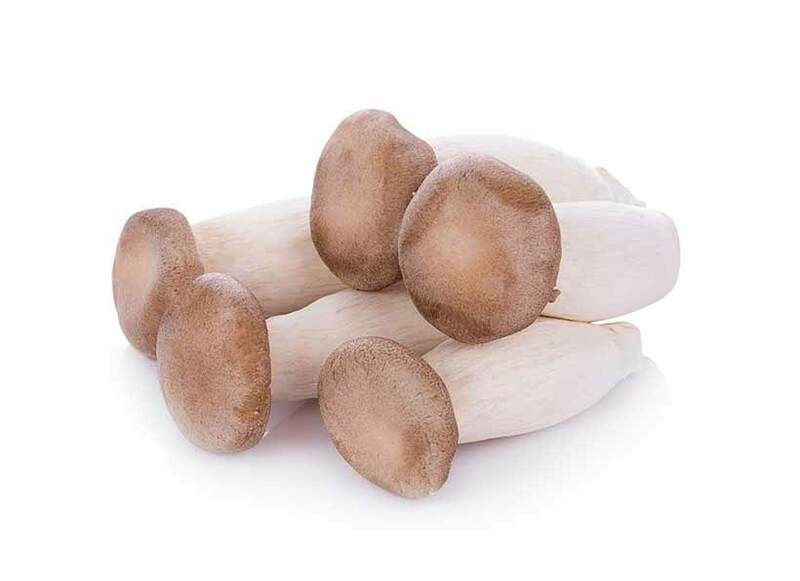 Shiitake mushrooms are available in dried form too, which have a powerful concentration of flavor (and nutrition). Key Point: Shiitakes are one of the healthiest and tastiest edible mushrooms. As shown above, king oyster mushrooms are one of the biggest types of edible mushrooms. They have a striking appearance and are very thick in shape, giving them an extremely chewy and spongy texture — a little bit like squid. For this reason, roasting king oysters in the oven works best and leaves you with a deep, rich flavor — especially if you add a bit of butter and salt beforehand. The mushroom goes by the scientific name of Pleurotus eryngii and it is native to Europe, the Middle East, and North Africa. The mushroom is easy to identify in the wild and, outside of Japan and Australia, has no poisonous look-alikes. Oyster mushrooms are a species which have long been used as a medicinal mushroom. Notably, studies show that they contain a significant amount of antioxidants and that their compounds exert anti-tumor and anti-inflammatory effects (9, 10, 11). Also, consumption of this edible mushroom appears to lower triglycerides and the LDL/HDL ratio (12). Although they can be a little expensive, you can pick them up for a lower price if you go to a Chinese/Asian market. Key Point: Big, tasty, and full of beneficial nutrients – king oyster mushrooms are great. Similar to morel mushrooms, the lion’s mane mushroom (Hericium erinaceus) has an unusual appearance. It is a species of mushroom…that doesn’t look like one. 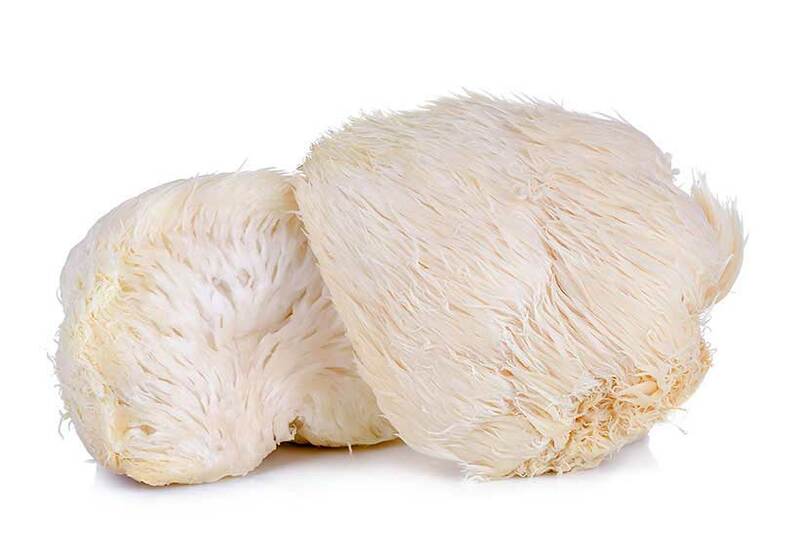 Significantly, research indicates that lion’s mane mushrooms have anti-inflammatory, gastroprotective, cardioprotective, and an inhibitory effect on cancer metastasis (13, 14, 15, 16). These mushrooms grow in the wild throughout Europe, North America and Asia. Although relatively rare in Western dishes, it plays a large part in Chinese cuisine. Despite this, the mushroom has become popular in the health and supplement industry, and a variety of products are available. These include extracts, tablets, and even coffee-mix drinks. However, rather than buying extracts, you can buy the real thing if you hunt around in some Asian grocery stores. Otherwise, you can also buy them as dried mushrooms. They taste pretty good and have a very intense meaty flavor. Key Point: Lion’s mane mushrooms are chewy, healthy, and odd-looking but delicious. Enoki mushrooms (enokitake) are long thin white mushrooms which resemble a piece of string. Again, they are one of the more unique looking mushroom varieties. 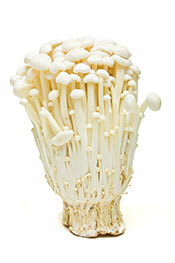 Enoki mushrooms taste great; they are also relatively simple to grow and cheap to buy. In certain Asian and Italian dishes, they can act as a replacement for noodles and spaghetti due to their chewy texture and noodle-like appearance. For the same reason, tossing some into a stir-fry has great results. Key Point: Enoki mushrooms work well in soups or stir-fries, and they make surprisingly good low carb noodles. Button mushrooms (Agaricus bisporus) are the baby version of shiitake and cremini; they are still very fresh and at an early-life stage. These white mushrooms are probably the most common—and widespread—variety in the world. In fact, they represent 90% of the edible mushrooms consumed in the United States (18). Despite a common belief that these mushrooms aren’t as healthy as other types, they have some impressive health benefits. Although they are not usually mentioned alongside the “medicinal mushroom” tag, button mushrooms have shown promise in clinical studies. 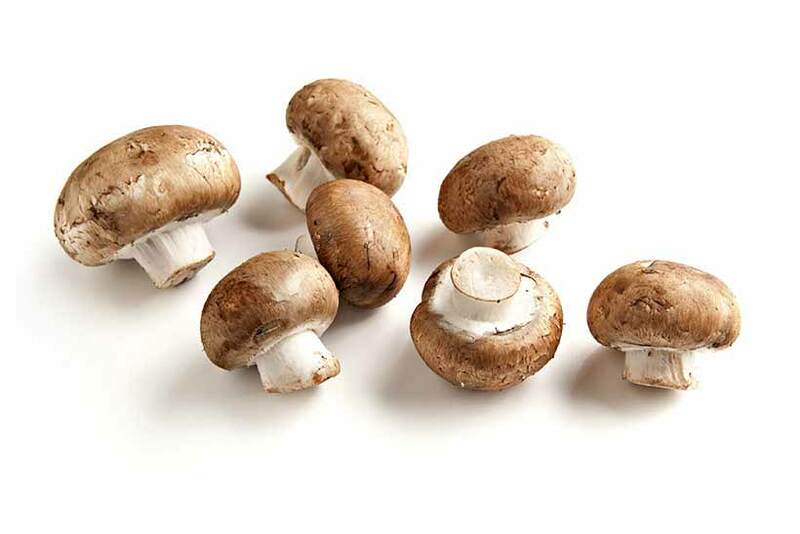 White button mushrooms enhance the strength of cells critical to the body’s immune system (19). In a study involving 24 healthy volunteers, 12 were assigned to eat a diet that included 100g button mushrooms daily, and the remaining 12 ate the same control diet except for the button mushrooms. Over two weeks, secretory immunoglobulin—an antibody involved in the immune system—increased by 56% in the button mushroom group only (20). Key Point: White button mushrooms are the most popular type of mushroom in the world. They’re good for you, taste great, and make a perfect combination with some bacon and eggs. If button mushrooms are the babies, then portobello mushrooms are the grandparent! 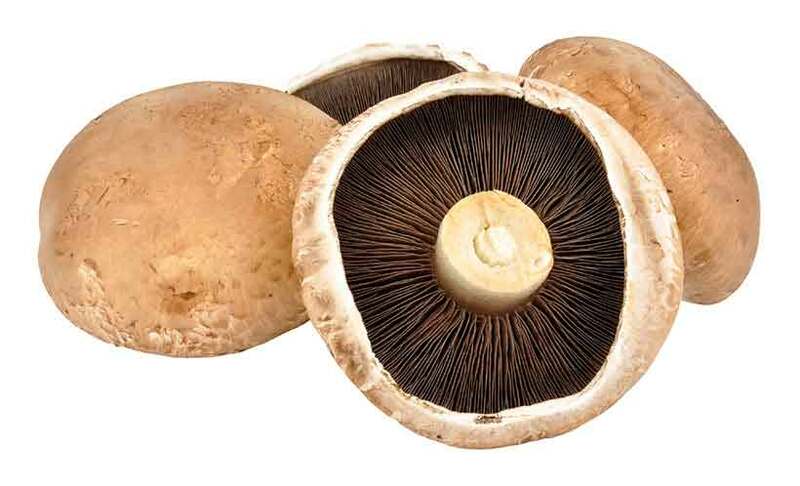 Portobello mushrooms are the same species—Agaricus bisporus—but at a late stage of life. The mushrooms are therefore much bigger and wider in diameter, as well as being deeper and richer in flavor. For me, they are one of the best types of mushrooms and baked portobellos are delicious — especially when they are stuffed with some cheese. Key Point: My favorite edible mushroom is a close tie between portobello and shiitake mushrooms. They both taste great, but one advantage portobellos have is the way they can be stuffed with the ingredients of your choice. 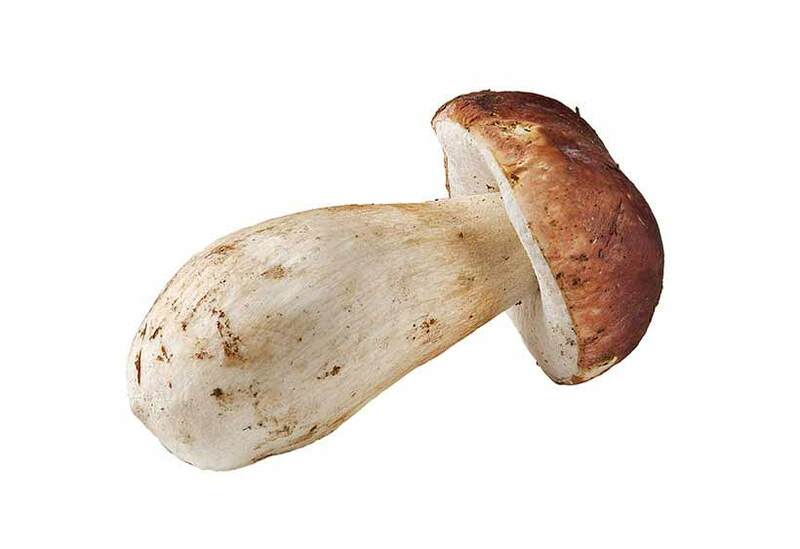 Porcini mushrooms (Boletus edulis) are one of the most popular sorts of mushrooms for culinary purposes. Taste wise, they have a deep and mild nutty flavor with an intense aroma. Porcinis can be either purchased fresh at markets or in dried form. Porcini mushrooms are also an attractive target for wild mushroom foragers, due to their easily identifiable features. 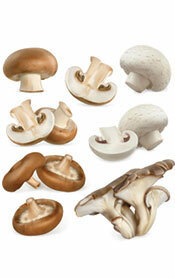 Animal studies suggest that extracts of these mushrooms help protect against cardiovascular disease. For instance, repeated daily doses of the mushroom resulted in significant decreases in blood pressure, triglycerides, and an increase in HDL (22). Key Point: Porcini is one of the most famous wild edible mushrooms. Just a final note to say: always be careful if foraging for mushrooms in the wild. It must be remembered that there are many non-edible mushrooms which contain potent poisons. Never pick and eat a mushroom if you are not 100% sure. Doing this without positively identifying the species is potentially very dangerous and—in some cases—fatal. Excellent information on different kinds of edible mushrooms. The images help us to identify the edible mushrooms. Thank you, hope you find it useful! Hi Todd, this is simply because we don’t really know. To say a certain amount would just be guessing, but mushrooms are a healthy nutrient-dense food without any major health concerns, so generally they are fine every day (in realistic serving sizes). Personally, I eat one or two different kinds of mushroom each day.